One of the 2 rumors that leaked last night has now been confirmed. Len Riggio, the CEO of B&N, has just filed SEC paperwork that informs the regulatory agency that he wants to buy Barnes & Noble’s 689 retail stores as well as the online retail site BN.com. The company has confirmed the news in a press release. The offer would spin off the Nook Media into a separate company under the current corporate leadership (FSM help them). B&N College currently operates 674 bookstores. The offer comes only a few days before B&N is set to release their quarterly earnings earnings on Thursday, February 28, and follows warnings that B&N expects to report bad news. BTW, the SEC paperwork revealed a second interesting detail. Riggio doesn't control 30% of B&N, like everyone believed; he now controls 37%. He also owns a holding company that controls another 8% of the company, and his greater concentration of shares means that if this becomes a stockholder fight then he only needs to gain the support of 3 or 4 major stockholders. Considering Riggio used to own B&N College outright before selling the business back to B&N, I have to wonder why he sold it and why he doesn't want it back. This point is off topic, but I suspect Riggio thinks the business of running college bookstores doesn't have much of a future (possibly due to the textbook price bubble). Interesting move, is it not? I think Riggio is trying to get rid of the parts of B&N that he sees as having no future (or at least being less viable), but it's not clear why the retail stores are being spun off shortly after the retail division head announced plans to close 20 stores a year for the next 10 years. But more importantly, Riggio doesn't see that that Nook Media has much of a future - from the viewpoint of a guy who built a retail chain, anyway. Considering that he famously doesn't even use his own hardware, Nook Media is probably better off without him. Then again, a simple binary split like this is probably a suboptimal option. B&N would probably be worth more if split in 3. B&N College could go to one of the other companies that run college bookstores (Follett, for example, has 900 stores in US and CAN). Then Nook Media could be sold off to a gadget company: MS, Google, Rakuten, anyone. Combining Nook and B&N College as a rump of a company is probably going to doom both parts. Rumors: B&N to Deemphasize the Nook? Going Private? No one understands just how FAST things can change. B&N was riding high, got smug, and BAM! The floor fell out from under them. Much of it was due to their own actions. That’s what smug will do: Kill you. This is the most logical split: keep retail (and online business tied to warehousing stuff) and spin off the digital businesses tied to Nook. The College stores don’t really operate like everyday bookstores: it is their content and audience that set them apart. Pearson has invested strictly in the Nook end of the business precisely for access to B&N’s College audience. And, as things stand, the retail bookstores are the only cash profitable part of the business: everything else loses money hand or fist or, ast best, breaks even (ie the College stores). The $64,000 question: if the entire thing is worth $800M at current stock price … how much (or how little) will Riggio have to pay for the whole retail company? $100M? $700M? Is the future value in Digital or isn’t it? The retail stores are (still) profitable while the Nook is not. Sure this cow is sick and will expire in the not too distant future, but in the meantime Riggio will milk it for all it’s worth. Riggio probably got rid of the college division because he was being sued over the original sale to B&N. It sounds like a good way to settle the looming shareholder fight. And shipping the bookstores with Nook gives them something to sell off to keep the cash flowing. A necessity with all the bad news out there now. If they had IPO’ed last summer, they might’ve cashed in bigtime. Do not ask for whom the bell tolls; it tolls for B&N. The way to salvage B&N and make it a competitor is to sack Riggio and Lynch and the other top execs. Even Goofy could probably do a better job than the current crew. None of these tactics addresses the fundamental flaws in B&N, such as the absolutely abysmal customer service or the failure to make Nook available worldwide. Inasmuch as the abysmal customer service was instituted due to the high demands of supporting the NOOK, and that making NOOK available worldwide is a NOOK function, both of those problems are dispensed with by Riggio’s offer to buy only the non-NOOK operations. If he works the offer right, he could get B&N’s New Jersey-based customer service operation and leave NOOK Media with that Philippine embarrassment. Nate, the college bookstore business is already part of Nook Media, and other companies have invested in that division, including Microsoft and Pearson. It would be very difficult to split Nook Media up without the consent of the outside investors. As for selling the college bookstore business to Follett, that would most likely trigger an antitrust review by the FTC and Justice Department. I’m not so sure. B&N College is reported as a separate division in the quarterly statements and even has its own name in today’s press release. For all we know B&N planned to bundle B&N College into Nook media and then changed their mind. It does not appear to be part of Nook media now. According to SEC filings the NOOK Media division does include the college bookstore division. On second thought it appears I misread the press release. How can Riggio buy the BN.com retail site without the ebooks? Would everyone have to go to a separate site for them? That just redirects you to barnesandnoble.com which sells everything. I meant that would the paperbacks and hardcovers new & used would be listed separately from their ebooks? No, it redirects you to the Nook dept. My point is that B&N already owns the domain. They could clone their site, clip out the non-ebook portions, and build a site at http://www.Nook.com. Boom, they have a separate ebookstore. I didn’t realize just how bad things were until now. A good way to see how popular something is, is to check out YouTube videos for it. 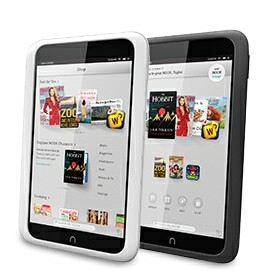 Last night I was thinking of the Nook HD+ and just went to YouTube this morning. There are devastatingly few user videos about it. That’s unlike the original NookColor, Nook Tablet, and all of the eInk Nooks. HD+ sales must have been an absolute disaster. I think that will be the first hardware to be discontinued. Unless B&N gets smart and makes it an open Android tablet. We’ll all know more on Thursday (although I expect news to leak Wednesday night).